Rep. Nancy Pelosi's (D., Calif.) choice to lead the House Climate Crisis Committee owned stock in several companies that rank among the nation's top air and water polluters. 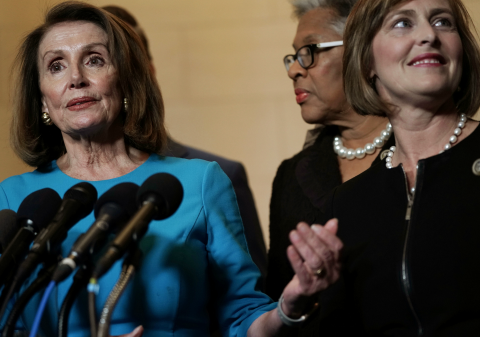 Last week, Pelosi announced that Democratic congresswoman Kathy Castor (Fla.) would chair the newly reconstituted House Select Committee on the Climate Crisis. Pelosi's decision to reestablish the committee, which existed from 2007 until 2011 when it was disbanded by Republicans, signals that climate change will be a top priority for the new Democratic majority. "This committee will be critical to the entire Congress's mission to respond to the urgency of this threat, while creating the good-paying, green jobs of the future," Pelosi said in a statement announcing the appointment. "Congresswoman Castor is a proven champion for public health and green infrastructure, who deeply understands the scope and seriousness of this threat. Her decades of experience in this fight … will be vital." Although Castor is poised to have tremendous power over climate-change legislation, it is unclear if her prior financial ties will pose a challenge for progressives who are already complaining that the new committee "will be incapable of solving the greatest threat to humankind." Financial disclosure reports filed with the clerk of the House of Representatives indicate that Castor has invested in corporations with questionable environmental records. When joining Congress in 2007, Castor reported owning between $15,001 and $50,000 of stock in Dow Chemical, which has consistently been labeled as America's top water polluter by the Political Economy Research Institute (PERI) at the University of Massachusetts Amherst. Castor's holdings in Dow grew throughout 2008, even as the company drew fire from the Environmental Protection Agency for allegedly violating the Clean Air Act and inadequately cleaning up dioxin contamination on the Tittabawassee River in Michigan. Dow's chemical plants, which the EPA estimated produced more than 600 million pounds of toxic waste in 2010 alone, have continuously been cited by state and federal regulators for discharging hazardous waste into the atmosphere and waterways. Castor began selling off large portions of her Dow holdings in early 2014, shortly after taking a more high-profile stance in favor of green energy and solar power. The congresswoman unloaded the last of her stock in Dow Chemical in May 2016. At the same time that Castor began severing her financial ties to Dow, the congresswoman purchased between $1,001 and $15,000 in Caterpillar, Inc. The company, which ranks among the Fortune 100, is the world's leading manufacturer of construction machinery, mining equipment, as well as diesel and natural gas engines. Castor purchased the stock despite the company's long record of flouting environmental regulations. Caterpillar was one of seven diesel-engine manufacturers that agreed to a $1 billion settlement with the EPA in 1998 for illegally circumventing federal emission standards. The settlement arose after environmental regulators determined that Caterpillar and other companies "deceptively" programmed diesel-engines to "produce less pollution" during emission testing than on the road. At the time, the $1 billion settlement was one of the largest penalties levied under the Clean Air Act. Since 1998, Caterpillar has been unable to remain out of the EPA's sights. The company agreed to pay a $2.55 million penalty in 2011 after "shipping more than 590,000 highway and non-road" vehicles without correct emission controls. In 2014, California weighed financial penalties against Caterpillar for allegedly violating air pollution regulations. Castor sold her shares in Caterpillar in December 2016. Dow Chemical and Caterpillar weren't the only polluters in Castor's investment portfolio. The congresswoman's financial disclosures show that she owned stock in General Electric and the Alcoa Corporation—two of America's top air polluters, according to PERI. Alcoa, the eighth-largest aluminum producer in the world, has faced criticism over its coal-fired power plants. One such plant located in Rockdale, Texas, was the subject of a 2003 settlement with the EPA, in which the company agreed to pay $1.5 million in fines and spend more than $330 million in strengthening its air pollution standards. Likewise, the scale of GE's environmental footprint has raised concerns among climate change advocates. The congresswoman sold her shares in both corporations in November and December 2016. It is unclear why Castor liquidated all of her holdings in Alcoa, Dow Chemical, GE, and Caterpillar at the end of 2016. Castor's office did not return requests for comment on this story. Castor's investment in the companies occurred as she simultaneously accused BP of "gross negligence" in the wake of the company's 2010 oil spill in the Gulf Coast. This entry was posted in Politics and tagged Energy, EPA, General Electric, House Democrats, Nancy Pelosi. Bookmark the permalink.